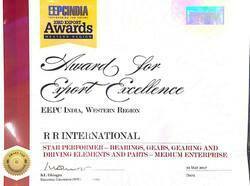 Our organization, "R. R. International", is a manufacturer, supplier and exporter of a distinguished line of "Automotive & Industrial Bearings". We have established our extensive work unit in Rajkot (Gujarat) where we design, manufacture, quality test our bearings and our packing (Export House) in Mumbai, Maharashtra, from where we pack and dispatch the orders for the clients. Our superior quality and precision engineered parts and components are availed by the leading names in engineering and automobile industries. We have a robust infrastructure that comprises ultramodern R&D unit and a quality control unit. A capacious warehouse also supports us in safe storage of the products. Our wide distribution channel assists us in timely delivering the orders in all parts of Middle-East, South America, Africa, Europe, Australia and the Indian Subcontinent. The orders are delivered via cargo and air. We offer easy payment modes like L/C on deferred payment methods (30 days,60 days,90 days) etc. We have grown leaps and bounds under the able guidance of our mentor, "Mr. Harjeev Singh Anand". He has always motivated us to perform up to our true potential and achieve success parallel to our caliber. We are a reckoned manufacturer, supplier and exporter of a variegated line of Bearings For Mercedes Benz, Scania, Volvo, Man, Daf, Renault, Hino, UD (United Diesel), Mitsibushi, Nissan, Ford, BMC Trucks as well as for RVI, ROR, BPW, Kassbohrer, Mack, Fuwa, Shmitz Cargo Bull, SAF, Arwin Meritor, Gigant (SAE), SMB, Standard Forge, Western Star, Freightliner, Rockwell, Tandem, Kenworth, Peterbilt, Fruehauf, Montenegro, York, Dana, Spicer, Eaton, Navistar Trailers and Trucks. 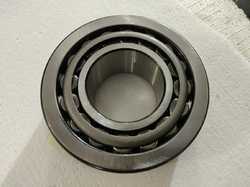 The bearings undergo CNC turning, CNC automatic grinding as well as Super Finishing. Our range includes Taper Roller Bearings, Cylindrical Roller Bearings, Clutch Release Bearings, Needle Roller Bearings, Needle Cages, Needle Rollers, Kinpin & Thrust Bearings, Steering Bearings, Water Pump Bearings Spherical Bearings and Non-Standard & Standard Ball Bearings. These are available in varying sizes, designs, shapes and other specifications. We offer these products in customized specifications as well for clients across engineering and automobile sector. We are a reckoned manufacturer, supplier and exporter of a variegated line of Bearings For Mercedes Benz, Scania, Volvo, Man, Daf, Renault, Hino, UD (United Diesel), Mitsubishi, Nissan, Ford, Fiat, Iveco, Toyota, Tata, Leyland, Eicher, AMW, Bedford, DongFeng, Mazda, Mahindra BMC Trucks as well as for RVI, ROR, BPW, Kassbohrer, Mack, Fuwa, Schmitz Cargo Bull, SAF, Arvinmeritor, Gigant (SAE), SMB, Standard Forge, Western Star, Freightliner, Rockwell, Tandem, Kenworth, Peterbilt, Fruehauf, Montenegro, York, Dana, Spicer, Eaton, Navistar Trailers and Trucks. These bearings are manufactured from superior grade SAE 52100 grade steel with premium grade rollers and cages as per SKF and FAG thickness and grade. The bearings undergo CNC turning, CNC automatic grinding as well as Super Finishing. Our range includes Taper Roller Bearings, Cylindrical Roller Bearings, Clutch Release Bearings, Needle Roller Bearings, Needle Cages, Needle Rollers, Kinpin & Thrust Bearings, Steering Bearings, Water Pump Bearings Spherical Bearings and Non-Standard & Standard Ball Bearings. 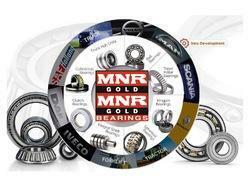 R. R. International offers a wide range of Bearings under the brand name, MNR GOLD Bearings. 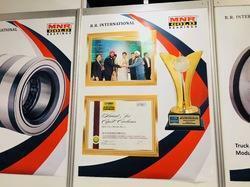 Our M/s R.R.INTERNATIONAL (MNR GOLD BEARINGS) is unified with a state of art production unit, which is incorporated with most advanced manufacturing facilities. Our facility is expanded over the area of 5000 square feet and located in urban city. We are committed to provide best grade product assortment to our highly respected clients that is why we have integrated our manufacturing unit with all the latest facilities.